Ann Marie “Jade” Bryan is a filmmaker, fashion enthusiast, and founder of Jade Films and Entertainment. She also happens to be deaf. As I stood outside of NYU’s Cantor Film Center to watch the screening of her latest film, The Shattered Mind, I was examining the gathering crowd with great interest; there were lots of smartly dressed people, many of which looked excited and anxious to get pass the red carpet and into the theater. The commotion, however, was unusually quiet. The crowd was predominantly comprised of individuals mingling and speaking in sign language. There was plenty of laughing and goofing around, but there was also very little noise – something most New Yorkers would notice in an instant. After a little while, the press was ushered into the film center, where we watched the stars snap pictures and pose with the director on the red carpet. Jade came by to introduce herself, although she was accompanied by an interpreter, she spoke firmly and clearly and explained what we were to expect in the next few hours. I was led to my seat with another two members of the press. As we settled in and surveyed our surroundings, I noticed that people were enthusiastically communicating with others situated across the auditorium. Because sign language doesn’t actually require you to scream at someone familiar at a distance, large numbers of people across the space participated in a single conversation. And because sight is the crucial sense involved in said communication, few people spent time staring into their mobile screens, unless of course they were taking pictures. The Shattered Mind is a film about Zhane Rain, a deaf woman (portrayed by Kyra Korchak) struggling to piece together the history of her hearing loss as she suspects she was not born deaf. Her family, in an attempt to protect her from the pain the facts could cause her, keep this history tucked away, tormented by the secrecy and the lies that stem from it. Although the film is fictional, some elements are fact based on Jade herself. This is not a silent film, nor one that keeps the hearing population in the dark, it’s a story told in the same way most stories are told – through images, music, and a great narrative that makes up the crucial component of good storytelling. As the director, Jade does what any other director does: she hates it when actors don’t stick to the script, fights for recognition and respect amongst her peers, strives to make the best films possible, and engages in fundraising and promotional efforts like everyone else in her field. The one thing that does makes her stand out though, is the passion she holds for advocating on the behalf of deaf minorities like herself. She is strong, opinionated, and motivated to do what she loves on her own terms. And as far as I can tell, she is going to get what she wants. 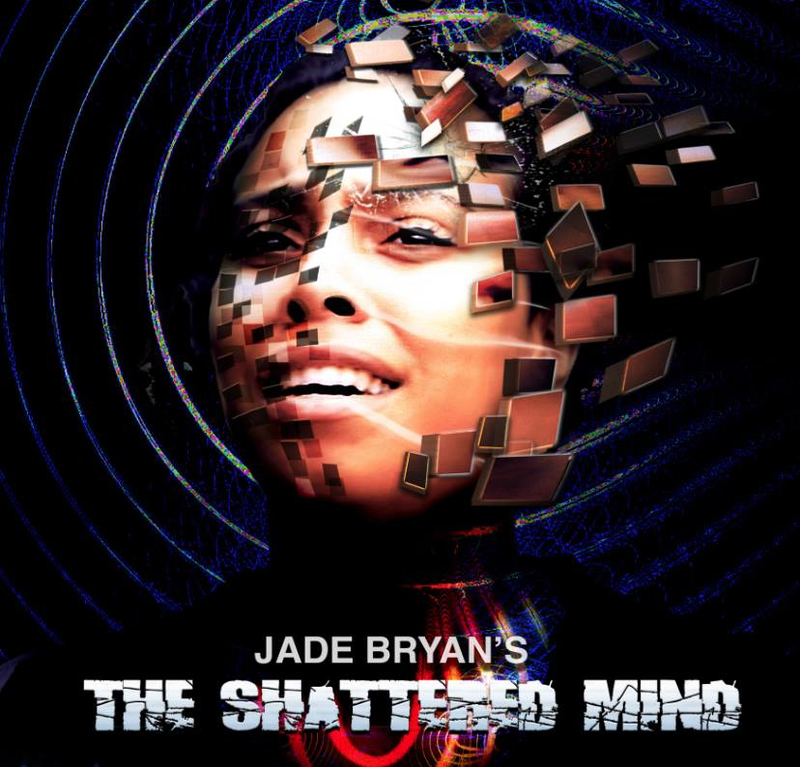 Liz Belilovskaya spoke with The Shattered Mind writer, director, and producer, Ann Marie “Jade” Bryan for an exclusive interview for The Untitled Magazine. Liz Belilovskaya: Where are you from? LB: Were you exposed to different art forms? JB: Yes, I was. My father is a photographer. My two brothers enjoy drawing; most of the time they draw from comic books. Because of their influences, I did the same thing – drawing Casper, characters from Archie, Richie Rich, Dennis the Menace, etc. I read and collected all these comics. Also, my sister is a fashion designer – to this day, I enjoy producing and attending fashion shows. LB: Were you into movies as a kid? JB: No, I wasn’t – I watched some TV. Growing up, there was no captions/subtitles that were accessible to me. So, I did a lot reading – reading became my movies. I was also writing poems and journals. I did a lot of outdoor activities my brothers did. I was a tomboy. Whatever they did, I followed and enjoyed the competition. LB: Did you enjoy partaking in creative projects? JB: When I was growing up, I enjoyed building stuff – [My brothers and I] built sling guns from branches, tree houses, stuff from old broken bikes, etc. There were no manuals for that stuff – we used our heads. I got bored easily, so I would always have to find something to do! LB: How did you get interested in film? JB: My interest in movies evolved later in life, after I registered at NYU in 1989. It discovered me. Since my father is a photographer, he was always having cameras around the house – I’d play with his cameras and take a lot of pictures. So, I’d say my interest in movie making started there without knowing it. LB: What does filmmaking do for you? JB: It’s an ongoing [and] burning passion to be able to tell a story and share it with the world. It’s an amazing, euphoric high when you sit in a movie theater watching [your] vision become reality. All the hard work finally comes to fruition, from concept to the actors’ speaking/acting out what was developed in a screenplay. All my creations give me happiness. LB: What aspects of filmmaking do you like and dislike the most? JB: I like directing actors. I dislike when the actors do not follow my script. It’s a huge pet peeve of mine. HUGE. LB: What are the biggest challenges both technically and creatively? JB: I continue to have two main challenges: The inability to hear sound when I am working on my films, and finding the right production team. There are some people who would take advantage of my deafness. It happened with The Shattered Mind. LB: How do you put the movie score together? JB: I just hired a team and laid out the instructions of what I want in order to communicate my vision – to align [the score] with the story. It’s not easy because it requires getting another person onboard to listen or review the audio. I don’t mean the sound team. Someone else, such as an interpreter (Bram Weiser) whom I have a good work ethic with; technically that person becomes my “ear.” Not everyone has the patience for this type of task. LB: How did you choose the music for The Shattered Mind – did lyrical content carry weight in the decision making process? JB: I have worked with the same composer (Jaynta Pathak) on another film. I gave him instructions. There was some music he created that I thought did not advance the vision of my story. So, I told him to create a new music piece. As for the lyrical content, no, I was not part of the decision making. I did instruct him not to have the lyrics overlap with the captions or with the actors speaking. My nephew (Adam Bryan) was another composer I worked with; he did the music for the closing credits. He also created one piece for another scene. Overall, I was happy with the result. LB: What kinds of books/movies/art do you like? JB: As for movies – all kinds. I like sci-fi, action and dramatic films. There are some good indie films that I can appreciate. [As for] books – mostly self-help or spiritual books, filmmaking and business; I keep those around. LB: Who are your inspirational figures? JB: My artistic influences include Stanley Kubrick, Steven Spielberg, Meryl Streep, Pedro Almodovar, Queen Latifah, Oprah Winfrey, and myself. Yes, indeed myself included, as I am my own inspiration – it’s because I have respect for their work. LB: Tell me about The Shattered Mind. JB: Like the character, Zhane Rain, I also endured a traumatic brain injury as a child. As a result of that injury, I lost my hearing. So, I know what it’s like dealing with family secrets, or not knowing the cause of my hearing loss until very recently. While growing up, I felt like I was living my life with a big “?” over my head; every time someone would ask me how I became deaf, I’d tell them that I had no idea. The film, which I wrote and plan to direct, is fictional, but I used some of my own life experiences while writing. LB: What went into crafting the characters? JB: I had a casting director (Lisa Dennett) working with me. We auditioned actors when we first produced a staged reading. We kept some of the actors for the movie production. When it came to hearing actors, I relied more on the CD for the sound part. I have some residual hearing and can hear well. However, I still need the CD on board to let me know how that actor sounds when reading their lines. Of course, I have the final say about whom I want for the part; after all, it’s my movie and my vision. LB: How difficult is it to gather funds via crowdfunding? JB: Very difficult. I crowdfunded 14 times to raise over $40,000 to produce The Shattered Mind. I have no intention of doing that again. I pray that my film gets selected at TRIBECA. When it does, it will become a new change for us, not just me but for my talent as well. I feel it’s time that deaf talent of color, who have been marginalized in mainstream movies and TV for too long, gain the visibility they deserve. And that I get to produce more content and create jobs for them. See, the film that you saw is a short, even if it’s 85 minutes long. The festival circuit gets the 48-minute version. In 2012, I tried to raise over $1 million to shoot the full movie (the script is 130 pages long) but I knew that was not going to happen. So, I only shot a couple of scenes. Hopefully the shorter version does well in the film circuit and gets picked up so I can shoot the full movie. LB: What would you have differently if you had unlimited funds? JB: I’d produce more films and pilots. This would mean that my production company could produce at least three to five films per year and hire the right crew. The Shattered Mind has been submitted to 24 film festivals around the globe. Feel free to check out Jade Bryan’s Kickstarter campaign raising funds for the film’s distribution. I write, draw, and sing badly. I'm also an insomniac. Occasionally I get to go somewhere very cool, and that makes me happy because life is short and everyone should get to travel.